Sarcos Research Corporation, and the Center for Engineering Design at the University of Utah, have long been interested in both the fundamental and the applied aspects of robots and other computationally driven machines. We have produced substantial numbers of systems that function as products for commercial applications, and as advanced research tools specifically designed for experimental use. 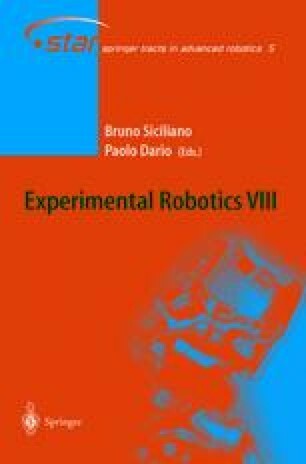 This paper reviews various aspects of the design and control of a number of robot-like machines ranging from our first projects, the Utah Arm and the Utah/MIT Dextrous Hand, to present work on humanoid robots and the Wearable Energetically Autonomous Robot (WEAR). Our systems have been used in: entertainment, operator remotization from hazardous environments, R&D, and medicine. In addition to the robots and their subsystems, extensive work has been devoted to command systems that drive the robots. Command systems have been: play-back supervisors, teleoperation masters, and various higher level approaches based on work from the AI community. Playback interfaces have included motion-capture mechanisms that provide movement-stream information to storage systems configured for later, repeated and coordinated, operation of many robots and associated mechanisms. Play-back command systems use human commands, from an “earlier” time, to command motions that are played out, over and over, mindlessly. Teleoperation “masters”, that operate in real-time with the robot, have ranged from simple motion capture devices, to more complex force reflective exoskeletal masters. Teleoperation interfaces have been composed of complex kinematic structures designed to perform motions compatible with operator movements and are attached via appropriate soft tissue interfaces. The masters emit lower level commands (joint angles) in real-time using the natural intelligence and sensory systems of the operator. AI-based command sources, blend higher level (simple) commands, with system and existing environmental states, to make decisions for the management of the robot. As with the playback systems, AI-based systems are programmed earlier to perform later operations. In the AI case, however, adaptive intelligence and sensory capabilities reside in the robot. Our general design approach has been to begin with the definition of desired objective behaviors, rather than the use of available components with their predefined technical specifications. With the technical specifications of the components necessary to achieve the desired behaviors defined, the components are either acquired, or in most cases, developed and built. The control system, which includes the operation of feedback approaches, acting in collaboration with physical machinery, is then defined and implemented. Control is considered a function of both feedback, and the designed-in performance of the robot’s physical machinery. It has not been true that bad performance from physical machine elements can be simply compensated out via innovative control methods and faster computers. After the completion of many projects we believe that the final frontier(s) of robotics reside at both ends of the brain and brawn spectrum. Both frontiers (barriers) are related to autonomy - intelligence/computation and energy/power. Recently, energetic autonomy has become a major interest at Sarcos and projects are underway to develop appropriate fuel-based servo-actuators to satisfy that need. Our objective is to develop power systems that are capable producing high performance servo-quality actuation for extended operating times without re-energizing the system. At the other end of the spectrum, we are working in collaboration with various groups to supply physical robots capable of operation under the control of advanced AI-based systems.